Sometimes everyone in my household is running in a different direction. I have girls’ night out, Michael goes to yoga, and boys are busy with school… I refuse to succumb to fast food fare. 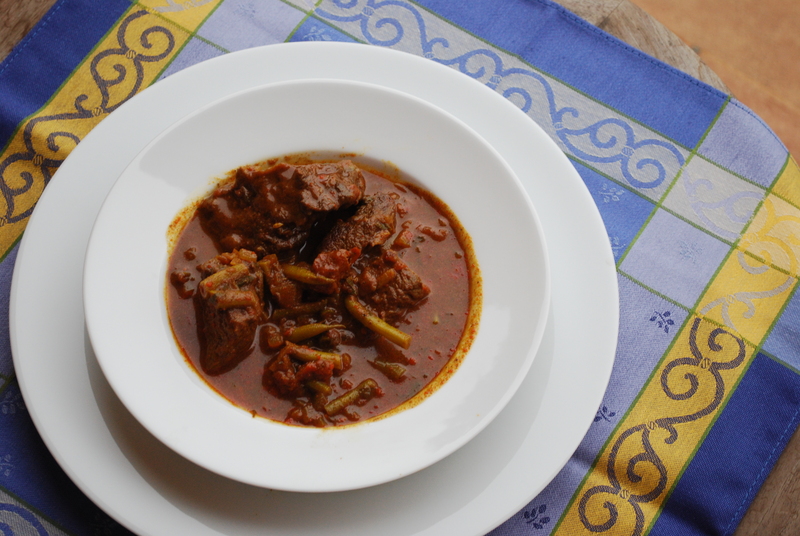 Therefore, this is a dish that you can make in the morning or even the night before and reheat. Occasionally I make it on the weekend and freeze it in double portions for whoever might be looking for some dinner. This is a super healthy, one pot, weeknight dinner. Everyone loves this dish. My friend Nina showed me this one. My mom and Nona cooked many other similar versions of fasoulia. A meatless fasoulia dish is also common. By now, you are probably wondering about the word fasoulia. Fasoulia is a dish in Greece, Turkey, Lebanon and many other Mediterranean and Middle East countries. It can mean green beans in some places or white beans or fava beans in others. In our house, it meant green beans. In the Sephardic, Turkish tradition, dishes with other green vegetables and legumes such as okra with meat, fava beans with meat, and white beans or black eyed peas with meat are everyday staples. 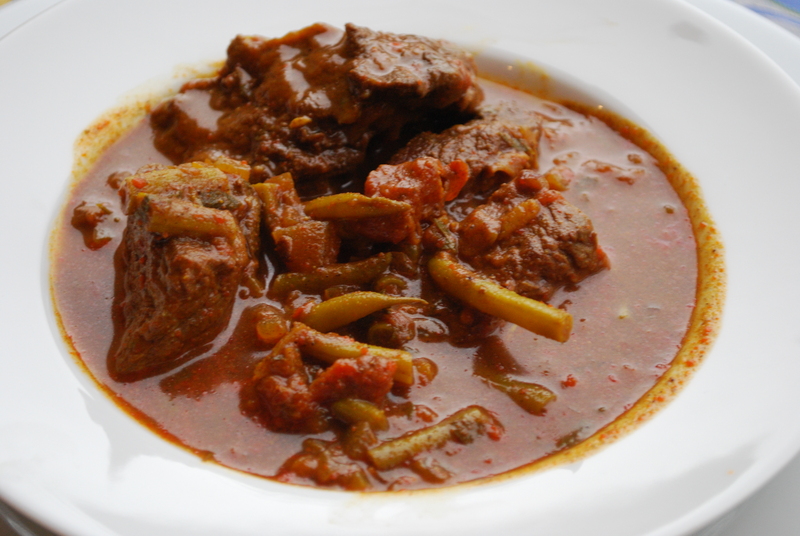 Combine a vegetable or legume with a protein, such as beef chuck, lamb stew, lamb chops, veal, or even chicken and slow cook it with tomatoes, fried onions, and spices. This is comfort food. Wash the haricort vert and trim the ends. Set them aside. Preheat a large Dutch oven on high heat. If you have one of those bright colored enamel Dutch ovens (like Le Cruset), this is when you use it. 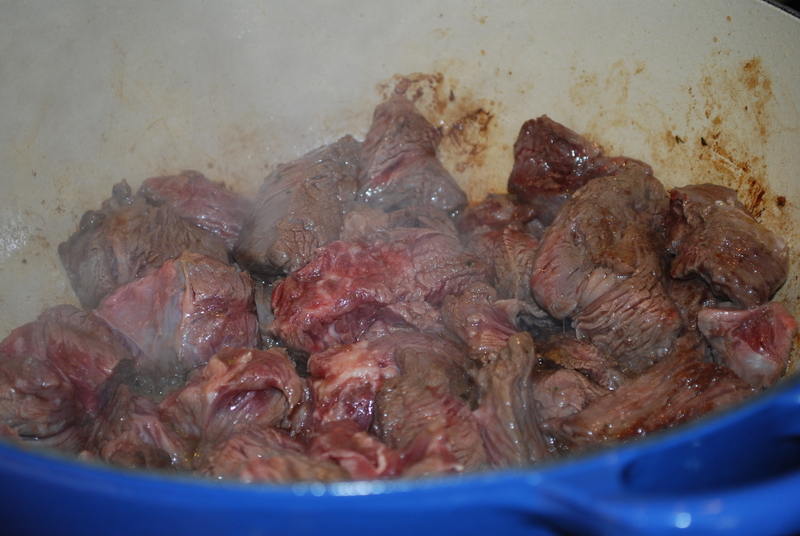 When it is almost to the smoking point, add 1 tablespoon of olive oil and the chunks of stew meat. Let the chunks of meat seer; do not disturb them by stirring for a few minutes so that they develop a deep gold color. You need to be fearless and let the meat sit, it is not burning, resist the urge to stir to soon. Finally, give a stir and then let the chunks sit and stick again. Season the beef with salt and pepper. When the chunks have browned on all sides, remove them from the pan to a plate, add the second tablespoon of oil to the pan, and throw in the chopped onions and garlic. Turn down the heat to medium low and simmer the onions until translucent and beginning to color. All the stuck browned bits from the meat will start to come off into the onions adding flavor. Place the seared meat and all juice that has accumulated on the plate, back in the pan. Season the meat and onions with salt, pepper, paprika, the chili powder, turmeric, and baharat. Add the tomatoes. Stir the mix and then add 4 cups of water. 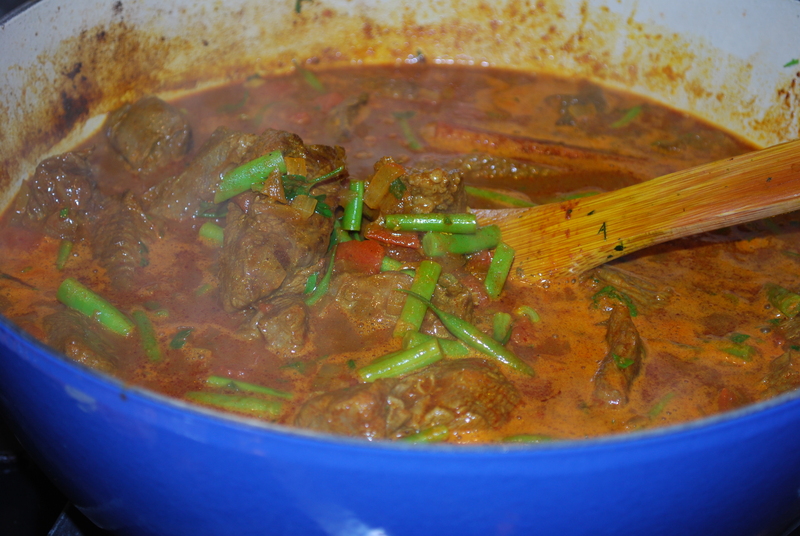 When the meat has cooked for about 1 hour add the haricort vert, cover and simmer for another 1 and ½ hours or until the meat is very soft and the spices have blended. Serve with basmati rice, rice pilaf, or brown rice.